“Breaking Illusion: Artist as Scientist” opened Wednes­day night, showcasing scientific approaches to art. More than 50 students, faculty and community members gathered to view the exhibit at the University of La Verne’s College of Law campus in Ontario. “Artists spend as much time as scientists do, honing in on their abilities,” exhibit curator, Conchi Sanford, said. It is rare to associate science with art; however, the new exhibit is allowing spectators to explore their similarities. Showcasing the work of seven diverse artists – including Toni Gentilli, Betsy Lohrer Hall and Kimiko Miyoshi – the exhibit contains photography, paintings, sculptures and various unconventional and scientific approaches to art. Artist Virginia Katz works with topography and creates her pieces based off of an environmental form. Much of her work involves colored acrylic to create natural occurrences such as waves. Jessica Wimbley merges genetic and biological history within her art. Her showcased pieces depict a mother holding her child with various fading faces and people behind her, to suggest they were all a part of her heritage. Another artist, Amber Crabbe, uses scientific theory when she decides what to photograph. In Crabbe’s art, she destroyed various items such as an old camera that she had an emotional attachment to, and photographed the remaining pieces after destruction to test her hypothesis. Her photographs are taken on a black background so that the destroyed item can pop out at the viewer. The item is placed in the center, has very vivid features and usually bright colors. Sanford is responsible for putting on and setting up the exhibit. She received her master’s of fine art from Claremont Graduate University and is currently a curator and a visual artist in Pomona. Sanford chooses all of the artists that are featured, along with the positioning of the art in the exhibit space, paying special attention to lighting and content. “I make sure each piece communicates with one another. When that connection happens, it pulls you through the exhibit,” Sanford said. Even with the personal experience of being an artist, Sanford is still intrigued by getting to meet other artists and viewing their work. “I get excited, like when you have a favorite professor and you get to go to their house for the first time,” she said. Artist Dianna Lindquist uses her art to convey society’s relationship with the environment and various species. Science is prominent in her art because she researches different species and uses their characteristics throughout her pieces. “I use frog eyes in my art as signifiers of consciousness for environmental change,” Lindquist said. Lindquist paints with bright colored ink to create an abstract image in which she places animal parts on to convey that we are destroying the environment. Students and faculty with no artistic background came to attend the opening as well. “The artists used crystalized structures,” David Michie, a third year law student, said. Even though Michie has no background in the arts he was still able to see the scientific connections within the art. “They both allow a common element of creativity,” Michie said. 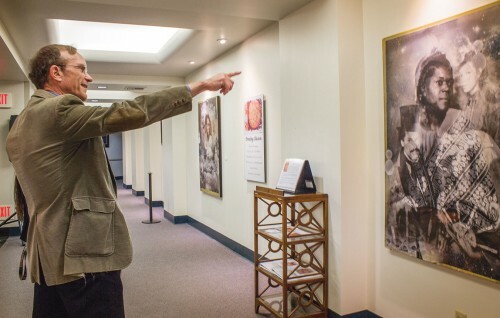 The La Verne Art Gallery is located at the College of Law campus at 320 East D Street in Ontario. Hours are Monday to Friday between 9 a.m. and 5 p.m., or by special appointment. Brooke Grasso can be reached at brooke.grasso@laverne.edu.